This program makes it easy to join forces with our partners to give the customer exactly the GPS performance they need with the best receivers and the best GPS collection app available in the market. TerraGo, a leading geospatial and GPS collaboration company, has launched a new partner program that will benefit GPS manufacturers, partners and ultimately the shared customers that deploy TerraGo Edge® combined with the industry’s most accurate and dependable GPS receivers. The TerraGo Affiliate Referral Program offers GPS dealers, GIS resellers and consultants the opportunity to partner with TerraGo, the industry’s leading mobile GPS data collection software provider, to gain a competitive edge, drive more product sales and implement more successful customer projects. In today’s mobile world, more and more enterprises are switching from proprietary GPS handhelds to smartphone and tablets to realize massive cost savings and dramatic productivity improvements. Single-use, GPS devices are increasingly being challenged and replaced with the superior hardware performance and software capabilities of iOS® and Android® devices with TerraGo Edge. Paired with high-accuracy, Bluetooth GPS receivers provided by TerraGo Affiliate Partners, TerraGo Edge can meet or exceed the most demanding user requirements. 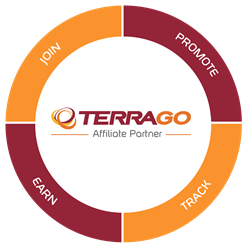 For more information on the TerraGo Affiliate program, click here. To learn more about the program and TerraGo Edge, register for the upcoming webinar, ‘Gaining the Competitive Edge: A TerraGo Affiliate Program Overview’, scheduled for Thursday, August 6, 2015 at 2 PM. Register here.